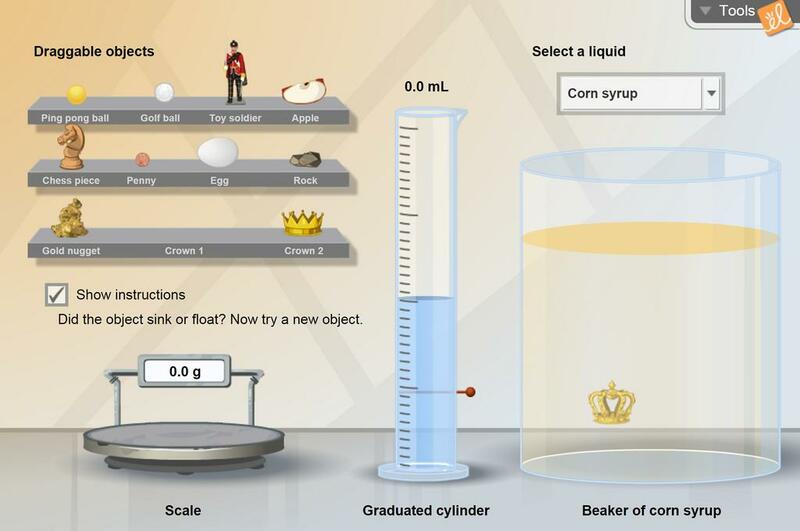 Measure the mass and volume of a variety of objects, then place them into a beaker of liquid to see if they float or sink. Learn to predict whether objects will float or sink in water based on their mass and volume. Compare how objects float or sink in a variety of liquids, including gasoline, oil, seawater, and corn syrup. State the SI units used for mass and volume. Measure the volumes of irregular objects using water displacement. Discover that density can be measured. Predict whether an object will float or sink by measuring its mass and volume. Define the relationship among mass, volume, and density. Calculate the densities of irregular objects. Compare the densities of liquids. Based on the gizmo lesson materials, this is a scripted lesson with teacher and student notes with questi... (more)ons and activities. Use this worksheet as an "Evaluate" of a 5E lesson on density for elementary students. Use this worksheet as the "Extend" of a 5E lesson on density for elementary students. Use this worksheet as the "Explain" of a 5E lesson on density for elementary students. This lesson was designed with Florida teachers in mind. Your students can experiment with density withou... (more)t actually measuring it. An introduction to density for elementary students in lower grades. Revisits prior knowledge in weight an... (more)d floating and sinking before posing the question of the relationship between grams and millilitres. This is an adaption I made for the assessment for my fifth grade students. This assesment covers our GLC... (more)ES. Great interactive lesson on Density. Fantastic lab! I use it every year. This lab does a great job revealing the relationship between mass, volume and density. Excellent! Easy to follow and students enjoyed the interactive activities. Comparing densities of various liquids was really helpful. This is an excellent resource! No items to assemble...they're all in the gizmo. Students loved it! Density and Buoyancy became more than vocab words with this! I was amazed by how often students wanted to re-act the floating and sinking of objects, even though the concept was a tough one for them. This is by far my favorite GIZMO! You could see the lightbulbs turning on when my students did this GIZMO. Great to use with basic measuring skills or a review. My students really enjoyed this Gizmo and understood the concept very well. I have used this Gizmo on the SmartBoard as a group activity. The students especially liked changing the liquids to see what happened. This is fantastic for our fourth grade unit on matter. It goes right along with our Sink and Float lab. Very good for differentiation when teaching density...same as the 6-8th greade assignment but more streamlined! Excellent lab in not only teaching concepts of density, but also how scientists must rely on the data given to what may already be known. All students can predict whether an object will sink or float. From there density takes on more depth and meaning.